A. Henriksen Shipping has signed a contract for a multipurpose Liebherr LHM 550 mobile harbour crane, which has a total lifting capacity of 144 tonnes. Operating out of the ports of Frederiksværk and Hundested, Denmark, the Danish company A. Henriksen Shipping handles most types of cargo including bulk, breakbulk, ro-ro, heavy lift and project cargo. Ten years after A. Henriksen’s first LHM purchase, the shipping, transport and logistics company will welcome the LHM 550 at the port of Frederiksværk, where it will be used to lift steel slabs with a total weight of up to 61 tonnes each. 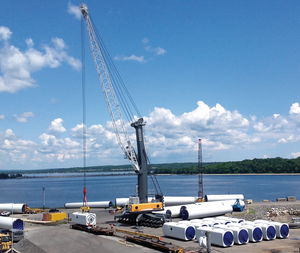 According to Liebherr, with a maximum lifting capacity of up to 144 tonnes, the machine will also be used for heavy lift and project cargo operations.